With the Lunar New Year festivities underway around Sydney’s circular quay, it’s a great time to celebrate Asian culture through exhibitions of all kinds. If you want to enjoy some from the comfort of your home, watch these five powerful talks from past TEDxSydney conferences. 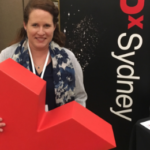 And don’t forget to register for TEDxSydney 2019, coming May 24! 1.After walking through the lit-up zodiac installation in downtown Sydney, you might come to understand young artist Louise Zhang’s talk on ‘What horror monsters can tell us about ourselves?’ Zhang identifies as a ‘third-culture kid’ and what she calls ‘a confusing blend of Chinese Australian, of religion desire fantasy and anxiety.’ For her, monsters reveal cultural beliefs. Body horror and fantastical creatures show us our fears even while they allure us through evoking complex social anxieties about race and belonging. Her art is ‘slippery and messy’ as well as seductive and confronting, transforming Chinese symbols into decadent creations. 2. ‘Dramatic Asian Woman Takes Over Stage’ could be the name of this TED performance, Creating a Social Media Icon with Chris Leben and Lee Lin Chin. In this funny, multimedia talk-performance, Chris Leben engages the TEDxYouth audience and shares the story of how news reporter Lee Lin Chin became a comic character who challenged stereotypes. Leben makes his argument for the importance of diversity in social media by showing outrageous clips ‘featuring an older Asian woman in a position of power’. The fashionista of the House of Chin then takes stage and challenges millennials that it’s all about her. Worth watching for a think and a laugh about the performance of identity in today’s society. 3.Carrot Clarinet by Linsey Pollak: Opening with his definition of creativity as ‘the putting together of two previously unrelated things and creating something new’ Linsey Pollak is a cross-cultural musical inventor and writer of festival songs including ‘BimBamBoo’ and Sound Forest. In this short video, Linsey Pollak crafts a clarinet out of a carrot. The sultry sound has to be heard to be believed and you’ll never look at carrots the same way again. 4.For more serious viewing, journey with Maria Tran through her memories of taking martial arts to combat the bullying she experienced as a young child. In ‘We need to embrace conflict’, Tran dares us to move toward our opponents. She teaches strength by sharing the powerful stories of her parents’ imprisonment and escape as refugees who left war for a new life in Australia. Tran then makes a case for being a creative artist, despite her parents’ wishes. It’s a moving talk about what it means to live a hero’s journey as a successful Asian actor and filmmaker, including getting stranded in Shanghai with only $20 in her pocket. A perfect talk for the Lunar New Year if you want to be inspired to live your dreams. 5. At the start of ‘Modern Citizenship’, Tim Soutphommasane brings alive Asian experiences in Australia by taking audiences to the noodle houses and bakeries of Cabramatta. Yet more than a celebration of food, his talk explores the meaning behind ‘inscriptions written in the high classical style of late twentieth-century Chinglish’ at the Freedom Gate. He invites us to consider ‘the Asian century’ not just as an economic opportunity but as a chance for cultural learning. In this year of the pig, a sign of wealth and celebration, we can learn from Soutphommasane about the richness and social value of multiculturalism in Australia.